China: Sale "flew in face of the spirit of the relevant international treaties"
PARIS, France (CNN) -- China has criticized Christie's auction of two Qing dynasty bronzes looted by invading French and British forces in 1860, saying the sale would hurt the auction house. 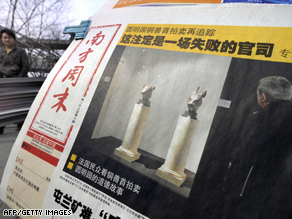 A Beijing news stand shows a report about the sale of the two bronze artifacts. The items were included in a huge three-day auction of art and furnishings that belonged to the late fashion designer Yves Saint Laurent. The sale, which ended on Wednesday, raised more than €370 million ($470 million). The bronze sculptures, a rat's head and a rabbit's head, were sold for €14 million ($18 million) each to anonymous telephone bidders at the auction in Paris. They were looted in the 19th century, when the invaders burned down the royal garden of Yuanmingyuan in Beijing. But China's State Administration of Cultural Heritage told the Web site of the People's Daily that the Paris auction "flew in the face of the spirit of the relevant international treaties and an international consensus on returning relics to their country of origin." More than 700 items were up for sale at the auction, which Christie's estimated could bring in as much as €300 million ($384 million). In the end it fetched 50 percent more. "It is one of the most sumptuous private collections of our time, a French paragon of quality and taste," Christie's said of the auction. Saint Laurent, who died last year, bequeathed his joint share of the collection to a foundation he ran with his partner. His lifelong companion, Pierre Berge, decided to sell the entire collection and to create a new foundation dedicated mainly to scientific research and the fight against AIDS, Christie's said. The collection displayed great quality and creative harmony, experts say. "They were extremely rigorous," Thomas Seydoux, an expert in 20th-century paintings, said of Saint Laurent and Berge. "Every work has been chosen for a date, for its artist, for its subject, for its pedigree and is the highest possible standard." The auction preview over the weekend drew tens of thousands of visitors to the Grand Palais hall in Paris. It was a glimpse into the reclusive designer's life with Berge, a stylish and lavishly decorated existence that few people saw and most could hardly imagine. "The first highlight was going into the apartment for the first time and really getting to grips with the quantity of material and the quality of the material that Mr. Saint Laurent and Mr. Berge put together," Christie's Vice President Jonathan Rendell told CNN. "You don't often walk into a house like this, and I've been doing this for a very long time." Paintings by Picasso, Mondrian and Manet joined sculptures, furnishings, ancient art and jewelry at the auction. Some of the artwork inspired Saint Laurent's designs, while others were simply decoration. "There are works from every corner of the globe," said Philippe Garner, an expert in 20th-century decor. It's "really a wide range of cultures and works from so many different centuries." Two paintings by Piet Mondrian sold for eight-digit figures. One of the artist's familiar grid patterns with blue, red and yellow sold for €21,569,000 ($27,191,525), more than double the estimate of €10 million ($12,938,557). Another grid pattern in black and gray, with the same estimate, sold for €14,401,000. Most of the items came from the apartment on Paris's Left Bank where Saint Laurent and Berge lived for decades. Christie's re-created whole rooms for the sale to convey the pair's taste and how they lived among their collection. At least two pieces in the sale are controversial: sculptured bronze heads of a rat and a rabbit, from China's Qing Dynasty. The Chinese government says they were stolen during the 19th century and belong to Beijing. The sculptures are still up for auction and are estimated to fetch €8 to 10 million ($10,350,846 to $12,938,557). CNN Senior International Correspondent Jim Bittermann contributed to this report.